The button is from Pinque Peacock (and I'm also show casing this today, so go say hi), and the ribbon is from 3GIRLJAM! 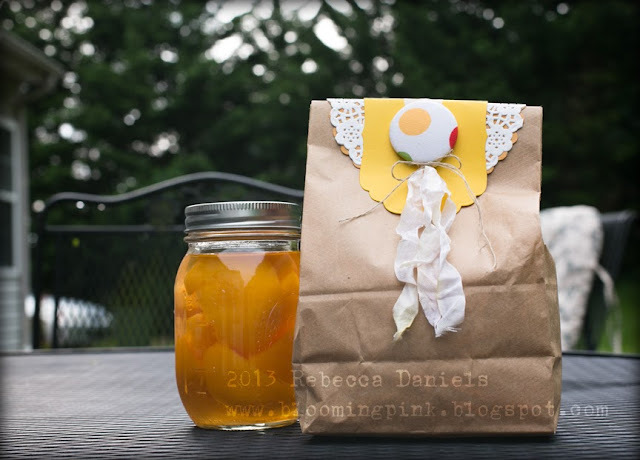 Love this idea Rebecca :)You made me hungry for peaches!! this is such a great idea. I love it. I am going to try using the button as a closure. Never thought of that. I want those PEACHES! Came over from the Pinque Peacockk blog to tell you that! That, and I love how you used your button as a closure. So clever! Have fun in that plane! Take great pics, LMK when you've posted or blogged them! Yummy! How sweet of you to gift your peaches to others. Thanks for linking up to the 3GJ Kraft with Ribbon Challenge. love that button on that bag, I am so using this idea!! Rebecca this is just to cute and anybody would love to receive this bag and yummy peaches. Heaven in a jar!!! I love your gift idea...you're certainly going to make someone's day with this yummy treat! Lucky recipients! I love your project! Such a gorgeous way to give a gift!!! Thanks for sharing this Rebecca! Thanks for linking up with 3 Girl JAM!